I’m a huge “list person” with lists for the day, week, season and year. 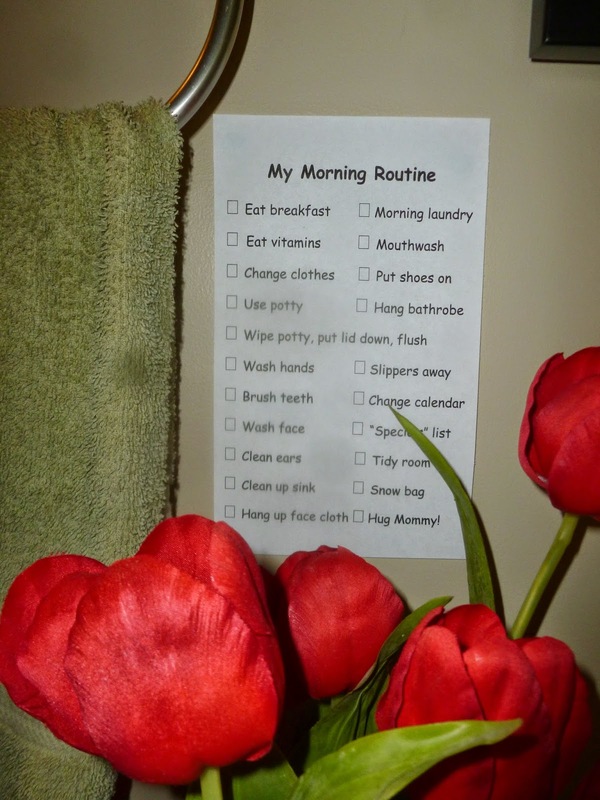 I also created a checklist for my kids to cut down on the chaos of getting ready in the morning. Their checklist is actually laminated and hangs in the bathroom where they get ready. It has helped them become more independent, and has completely saved my sanity! The final item on the list is “hug mommy.” It is a wonderful way to transition from “work” to “free time” before the school bus comes, or before we head out together for the day. One of the most “pleasant places” for me is in my bedroom, door closed, scented candle lit, Bible open, journal ready, eating hot oatmeal and drinking coffee. While sitting in the same spot every time, my “prayer seat,” I gaze at the cross and find deep peace and connection with God. After years of being bogged down with raising little ones, my husband and I have finally found a rhythm that allows each of us to escape and become our own person again. Saturday mornings he is “on deck” with the kids and I get to retreat to my bedroom sanctuary to pray and write. Sunday mornings I’m “on deck” with the kids and he goes off on long runs, and then to a coffee shop with his running friends. As a result of my choosing to have my “me time” in the house, rather than at a coffee shop or at the gym, it has taken years to establish the boundary that when “mommy is having her alone time” my kids, or my husband, can’t just barge in to tell me whatever is on their minds in that moment. I recall an actual fight with my husband where I got ugly, screaming that if he didn’t help maintain the boundary of my prayer space, I was going to load up the kids in the mini-van on Sunday, find his running route, and stop him at mile seven of his ten mile run, breaking his stride, just to tell him that we were out of batteries. After that fight my sanctuary was restored, the boundaries were firm, and my prayer time became reverent and fruitful. However, recently, that has all changed! Maybe it was the relaxed nature of summer, I don’t know. But suddenly my kids are barging in to “hug mommy” at the end of their morning checklist. As sweet as that sounds, it’s like a band of screaming banshees charging through a yoga studio in the middle of a meditation class. It completely shatters my concentration and severs the line of communication I’m having with God in that moment. It sets me back and I spend the rest of my alone time trying to find that place of peace again, that connection with God. So today, when Mason came in to “hug mommy” at the end of his checklist, and sneak in two or three other things he wanted to tell me, I told him firmly that from now on he needed to wait until I came out of my alone time to hug me. I then asked him to repeat the same message to Zack and Jocelyn so I wouldn’t be interrupted two more times. As he left, I heard him yell down the hallway, “Zack and Jocelyn – Mommy doesn’t want to be hugged.” I felt like the worst mother in the world! What mom wants to send the message to her kids that she doesn’t want to be hugged? The remainder of my alone time was spent in guilt, arguing with myself: Everyone needs alone time to refuel and recharge. Doing so makes me a better mother, right? Even Jesus routinely went away by Himself to pray. So why do I feel so awful? Why am I so filled with guilt? What happened to the “pleasant” feeling I had before Mason came in? That was it – the word “pleasant” was the key to the answer. Although “the boundary liness have fallen for me in pleasant places” because my husband is so supportive of my alone time, I didn’t define those boundaries “pleasantly” with Mason. Instead, I was quick with my words because I wanted him to leave as quickly as possible. It is completely fine to establish boundaries, in fact it’s the healthiest thing we can do for ourselves, and everyone around us. However, how we establish those boundaries is critical. If I’m too quick and stern with my kids, they might maintain the boundaries, but it will be out of fear. If I’m loosey-goosey and lax with them, which I guess I was over the summer, the boundaries get blurred and my kids get the message that the lines have been changed or no longer exist. What I need to do is reestablish those boundaries “pleasantly,” lovingly, in terms my kids can understand. I need to help them understand that we all have different needs, different ways of decompressing and rejuvenating. I need to make the comparison for them: Just like they need playdates every Friday to blow off steam, run wild, not have a routine and a schedule after a long week at school, I need alone time to reestablish my center, clear out the chaos of the week, and find that place where I can hear God. They would completely flip out if I interrupted their playdate to tell them to do homework or some chores. I would be derailing the story-line of the epic battle they were fighting, or breaking their concentration building the Lego creations they have envisioned in their minds. Likewise, them charging in interrupts my journaling where I’m working through a problem or an issue, or severs the connection I have with God when I’ve finally reached my core in prayer. That’s where I went wrong… boundaries! It never occurred to me to explain to my kids that mommy needed alone time. I think after years of hoping for privacy in the bathroom, I was so elated when I won that battle, I just gave up on the rest. My kids are teenagers now, but they still have no problem barging in and interrupting me whether I’m working or praying. Maybe it’s not too late for me, Claire. I can still try to follow your plan! Thanks so much for your comments Liz! And I’m thrilled that you and your husband take turns with the “on deck” thing too. It makes all the difference in the world. Liz has a great blog called Simply Complex Mom. You can check it out at http://simplycomplexmom.blogspot.com.